Metal roofing is one of the more popular roofing options, but many people still hesitate about choosing what is widely-considered a durable, weather-resistant and attractive roofing material. This hesitation is generally due to misconceptions about this affordable roofing option. 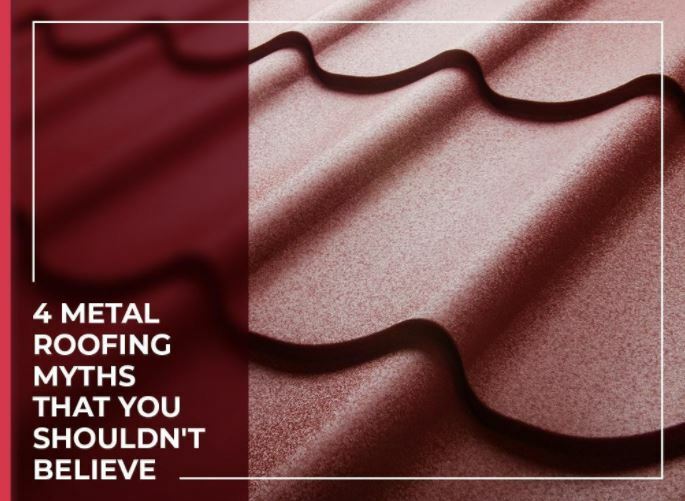 Here’s a rundown on four typical metal roofing myths and why they’re just that: myths. Metal conducts electricity, so many people believe that having big slabs of sheet metal over their homes will act as a magnet for lightening. The truth is, there are no evidence to support the idea that metal roofs are more susceptible to lightning strikes than other roofing materials. Since water can cause metal to rust, most people are reluctant to choose a metal roofing installation despite its many benefits. After all, they think their new roofs will quickly succumb to rain and snowmelt. While rust problems are a problem for older metal roofs, today’s metal roofs — like our Standing Seam Metal Roofing Lifetime System™ — are made with innovative technology designed to minimize, or totally prevent, rust damage. Our metal roofs are designed to withstand rain and snowmelt for years after installation, removing any concern about metal roofs having a short lifespan. Many people think that metal sheet roofs are the only kind of metal roof available. However, metal roofs come in a variety of different styles and forms. Not only are metal roofs available in a wide array of colors, they also come with different aesthetics like our Standing Seam, Ironwood Shake™ (designed to mimic classic wood shake) or metal tile options. This means a metal roof can give you a durable cover for your home that can also beautifully set it apart. Ever heard the rain fall on a shed’s metal roof? Many homeowners avoid metal roofs because they’d hate to hear the same thing in their homes during a rainy day. Our team of residential roof installation specialists have been installing metal roofs for decades, and our customers never complain about noisy roofs. This is because metal roofs are just as quiet as other types of roofing material…provided your roofing contractor correctly installs the right amount of deck and underlayment. Don’t let these metal roofing myths keep you from choosing a metal roof. Trust State Roofing for professional roofing products and services. We install metal roofs for clients in Seattle, WA and nearby areas. Call us at (360) 205-3100 or fill out our contact form to request a free estimate.